These are the end times for traditional enterprise resource planning (ERP) solutions. Overstatement? Not really—especially for growing businesses like yours. Old-school ERP systems are simply too slow, complex, and inflexible to keep up with today’s business climate. 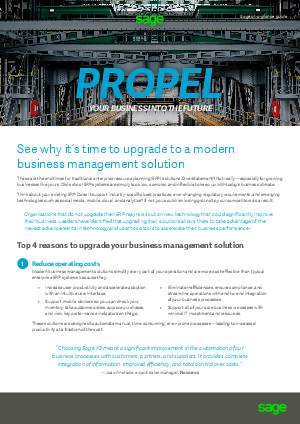 Think about your existing ERP. Does it support industry-specific best practices, ever-changing regulatory requirements, and emerging technologies such as social media, mobile, cloud, and analytics? If not, you could risk losing ground to your competitors as a result.